Earlier today, Apple has revealed the App Store dashboard for developers showing iOS 12, its latest and greatest mobile operating system, is now powering 72 percent of devices sold in the last four years. Just a month ago, the company reported that iOS 12 powered 63 percent of iPhones, iPads and iPod touches unveiled since September 2014. 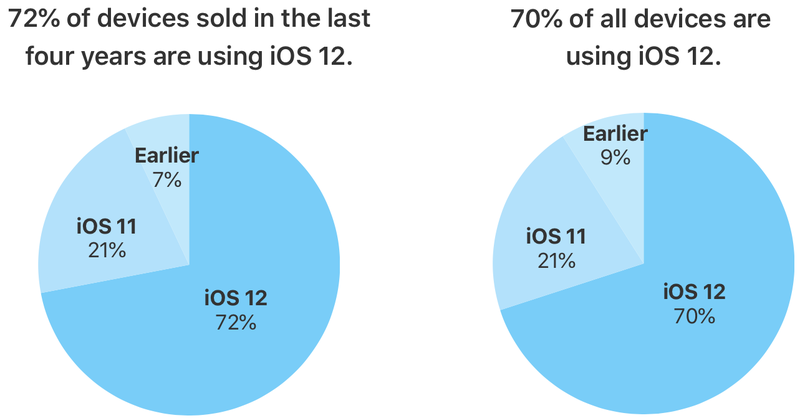 21% of iOS devices are running on iOS 11. By comparison, App Store logs captured a little more than a month ago on October 29 showed 63 percent, 30 percent and seven percent of devices introduced in the last four years were using iOS 12, iOS 11 and older editions, respectively. In terms of all active iOS things in the wild, Apple said a month ago that iOS 12, iOS 11 and older editions was powering 60 precent, 29 percent and eleven percent of all devices.